Dr. Real Bird is a business instructor at Little Bighorn College in Crow Agency, Montana. 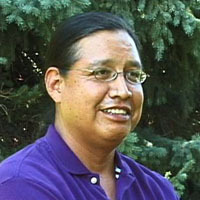 He has developed educational resources for the instruction of Crow and Hidatsa language and culture. Dr. Real Bird has also produced a video for orienting new instructors to American Indian Students. His interview here addresses the institution of Crow teasing clans. Crow Teasing Clans - Lanny Real Bird.